3,4 - 4,4,5..........Bingo von Ellendonk. 3 - 4,4................Cona von Niederkassel. 4,5 - 5,5,6..........Satan von Ellendonk. 4,5 - 5,6.............Blanka von der Au. Bren vom Blitzkrieger had full dentition and DNA tested as vWD affected (VetGen). She lived to 8½ years of age and passed away from intestinal cancer while her dam lived to 8 years of age and her sire to 10 years of age. Bren is litter-sister to Baron vom Blitzkrieger, SchH 2, OFA Good. Bren's sire, Ilo von der Weyermühle, passed the Körung at two years of age with highest possible ratings for courage and working drives (very high protective instinct, fighting spirit and courage, high hardness and middle sharpness). Ilo is also 'V' rated in conformation and brother to Kleo von der Weyermühle, winner of the working IDC World Championship in 1996. Bren's dam, Cocoa von Warringhof, passed the ZTP with highest possible rating for protection, courage, fighting drive and self-assuredness and high hardness plus earned her V rating under Ottmar Vogel in Germany. Cocoa was also pronounced in bitework in her SchH 1. 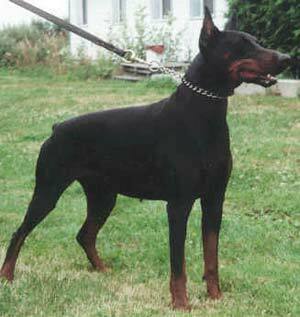 Hakim: sire of the vom Blitzkrieger “L” litter (Lazer).